Count all the birds you see and hear. Remain stationary; count at a fixed location. Do not travel more than a couple hundred feet during the count. 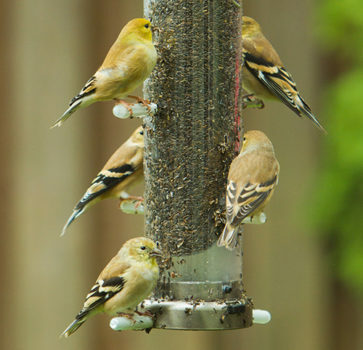 Count for at least 5 minutes, but preferably not more than 10 minutes (unless you are still encountering new birds). Submit your data to eBird.org so it is available to Oregon 2020 and other scientists. Any Oregon data submitted to eBird that meets the criteria above will be utilized by the Oregon 2020 project. 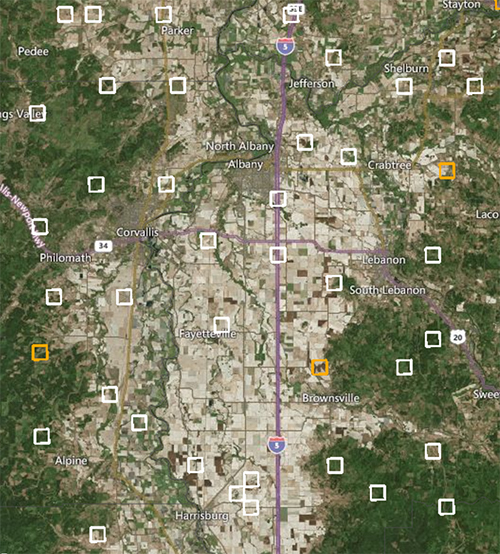 Hotspot Squares are 1 square-mile sections chosen at random from each of the 36-square mile Townships across Oregon. You can read more about Townships and their history here. We have just over 2800 Townships and, therefore, Hotspot Squares in Oregon. These squares provide a more even distribution of survey effort, rather than just clustered around cities, parks, and other popular birding locations. Where Are Hotspot Squares Located? 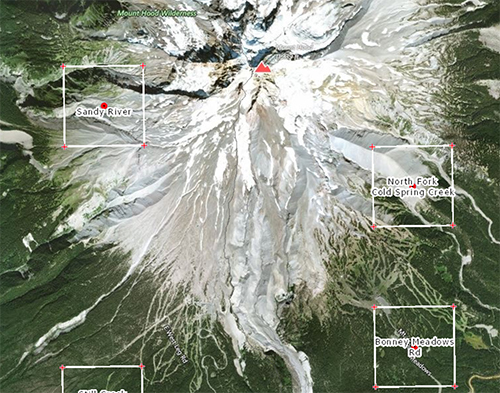 Click here for an interactive map of all Oregon 2020 Hotspot Squares, hosted by Oregon Explorer. Your goal is to count birds within the boundaries of these squares using our recommended methods. Click the plus-sign in the upper left of the map to zoom in until individual Hotspot Squares are visible. Continuing to zoom in will display Hotspot names, GPS coordinates, public roads, and other landscape features. You can also locate Hotspot Squares near you on-the-go using our Oregon 2020 Birds App. This app is free and available for both iOS and Android systems. 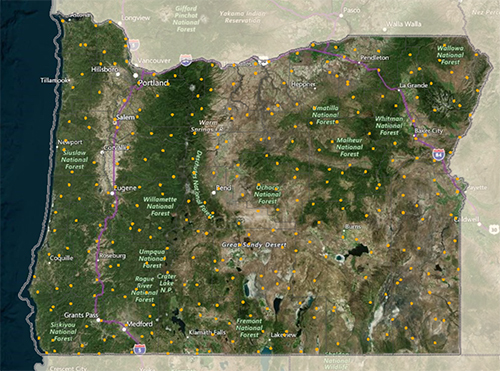 On Oregon Explorer, click the checkbox next to “Surveys Conducted” to display all previously surveyed locations within or near Oregon 2020 Hotspot Squares. Empty squares without flag icons need birding data! Locate an under-surveyed Hotspot near you and count birds in it following our recommended methods above. Click here for answers to frequently asked questions about Hotspot Squares, as well as a downloadable PDF with project details. How many Hotspot Squares can you visit by 2020? The primary value of yard counting is that you are probably the only person who would or could ever collect bird data from your property. We wouldn’t have this information without YOU! Yard Counts are incredibly simple to add to your current birding routine. Just pick a spot in your home or yard, count birds using the recommended methods above, and submit your data to eBird. What if I already count birds in my yard? Super! As long as you follow the protocol above, and share your data to eBird, rest assured Oregon 2020 will make use of your data. Our project needs birders who like to visit new birding locations, and count birds off the beaten path. After all, to leave a state-wide legacy of data, we need data from across Oregon! This could be the square closest to you, or in a distant area of the state. We have over 2,800 squares to choose from! Count birds in it following our recommended methods above. Aim for at least 4 stationary counts within the square, spaced at least 0.1 miles apart. Then submit all your counts to eBird. That’s it! Repeat this protocol with as many Hotspot Squares as you can. Will you become the top Hotspot Square explorer in your county?